Missed on 14th September, 1916, following the bursting of a shell, Private John Robert Holden, East Lancashire Regiment, son of Mrs. Holden of 24 Laburnum Street, Haslingden, was on Febuary 6th, 1917, reported to have been killed, and the circumstantial evidence just to hand, is strong that he was a victim of the exploding shell. A single man, 32 years of age, he was well known as a quarryman at Hutch Bank before the war, and he showed his metal by enlisting within four or five weeks of the outbreak. He went to the front twelve months ago last September. His mother, who has borne with fortitude the suspense of not knowing her son's whereabouts for five months, and for whom the deepest sympathy is felt now that her grave doubts have become a certainty, was informed last September of the missing of her son in a letter signed "The Boys of 12th Platoon, C. Coy., 9th Battery, at Salonica." "It is with very great sorrow, "began the boys, "that we write to inform you that your son was in the missing list when the roll was called after an attach we made last Thursday. He was last seen by a comrade close to where a shell burst, and it is feared the worst has happened. You will no doubt have been notified by the authorities by the time you get this, but it was suggested by his pals that we should drop you a few lines, seeing that we have all been together for over two years. "It may be some consolation to you to know that he played his part well in this great cause for which we are all fighting. There is just a possibility that he may have been wounded, and got into the enemy's lines, as no news of his body being found was handed in by the search parties, but we are afraid this hope is very remote. We only wish it could be so." It transpires from another letter, written by another party to Mrs. Holden, that her son's body was found by a scouting party. On him were two Bibles, one in English, and the other in Greek, and a hymn book. "I think he had been killed by a shell, but couldn't be sure," added the writer of this letter. In loving memory of my dear Son, Pte. 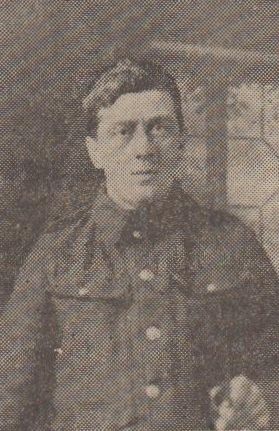 John Robert Holden, of 24 Laburnum Street, who was killed in action on September 12th 1916, aged 32 years. Which will never be forgot. From his sorrowing Mother and Sisters, Margaret Alice and Lydia, also three Brothers serving. Mrs. Holden, of 24 Laburnum Street, Haslingden, has received the following versus from the man who found her son. He composed them after finding the body of Private J.R. Holden, East Lancashire Regiment, which had lain from September 1916, to February 1917, and it is our sad duty to record the writer's touching impression. Until we knew him still in death. How did he come? as we have come? But how came he to die? By bomb, or ball, or bayonet? We cannot name the death he met. And in that instant Death him named. To keep night prowling beasts away. And seek in vain the blessed host. Till furled is all the sky. May by that death be glorified." In ever loving memory of Pte. J. R. Holden, of the East Lancashire Regt., whose death was presumed on September 13th 1916. He died to save the world from fear. Throughout this tortured world again. Who perished for the Motherland. His life, that all he loved might live. From his sorrowing Mother and Brother Bert; also his Sister and Brother in law, Lydia and Fred, 24 Laburnum Street, Haslingden; also his Sister and Brother in law, M.A. and Jim, 10 Malt Street, Accrington. They miss you most who love you best." From his two Brothers, Arthur and Roger, and Sister in Law. Three links have gone for ever." From Mr. and Mrs. J. Rawcliffe, 10 Malt St, Accrington.